You are responsible for the management of a 60-plus unit shopping centre. Now imagine that there is a public right of way through the middle of the centre, leading to a major transport hub – the task just got more complicated. Now factor in the largest sporting event in the world, happening just a few hundred yards away. This was reality for Savills, managing agents for the Stratford Shopping Centre in East London and OCS, their security contractor. OCS’s Legion security team mobilised the three-year contract in January 2012 and planning for the Olympics and Paralympics was an immediate agenda item. With a ring of steel around the Olympic Park any security threat could be displaced to nearby public facilities. Increased footfall associated with the Games would itself present challenges. The Stratford Shopping Centre is a crucifix. Malls running north-south and east-west meet at the Central Square. The east-west mall links Stratford Broadway with Stratford train, Underground and DLR stations, as well as the pedestrian bridge across the railway lines to Westfield and the Olympic Park. Opened in 1976 and revamped a few times since, the shopping centre does not benefit from the clear and secure demarcation between public and private space enjoyed by more recently-constructed centres. Several of the service routes are public roads and the local authority owns the routes through the centre. In fact Newham council relocated traders from a popular street market to the West Mall when the centre was first built. The public rights of way through the centre mean that it is open 24 hours a day with retailers generally open between 9am and 6pm. The usual rostering is six staff on days and two on nights. OCS mans the control room in the management suite, monitoring CCTV and communicating with staff on the ground. During the Olympics staffing was increased to 12 during the day and six at night. 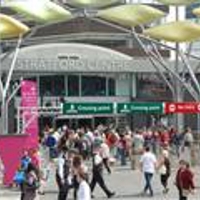 To ensure all staff working at Stratford were familiar with the centre and procedures, the centre management team worked with OCS to develop a complete site evacuation prior to the Olympics, bringing all staff on site to complete the necessary emergency training. Pedestrian traffic through the centre is normally around 460,000 people a week but, during the Olympics this increased by an average 20,000 a day. Security staff are more than a passive presence – they will give directions and check on people who may give cause for concern or just need help. OCS staff are trained to defuse situations rather than to confront people. They have no specific powers and will therefore only restrain someone if there is a threat to their own or someone else’s physical wellbeing. Problems and incidents are those facing any inner-city shopping centre – shoplifting, vagrants and occasional abuse when enforcing rules such as no-smoking. OCS is there to secure the common areas. Retail units are responsible for their own security but OCS staff make sure they maintain a good rapport with managers and they work together to keep the centre safe. All outlets have the Shop Alert system which when activated shows a visual alert on a graphic in the control room. The typical response time is around a minute. OCS has recently introduced body-worn cameras at the centre. The camera is incorporated into a badge holder – the security guard simply slides down the badge to activate the camera and audio recording. This also reveals a clear Recording in Progress message. The advantage of the cameras, says Savills security manager Lee Gleeson, is that it helps to defuse situations: “People can see that their words and actions are being recorded. The images may depend on the position of individuals but the audio is always clear.” The cameras record for up to eight hours and film can be used in evidence. The cameras are not covert so require no additional licensing.